The framework for governing the new province of Carolina is credited to John Locke, philosopher, friend, and personal physician of Anthony Ashley Cooper, one of the colony’s eight Lords Proprietors. Locke’s Fundamental Constitutions were socially and politically conservative, but liberal in their ideas of religious freedom. 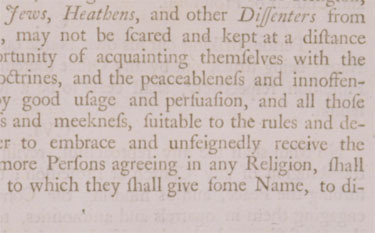 Article 97 guaranteed freedom of worship to “Jews, Heathens, and other Dissenters from the purity of the Christian Religion.” Although the colonial assembly never endorsed the provision, British Charles Town became known as a place where people of all faiths except Catholics could do business and practice their religion without interference.